For the man who subtly advised closeted co-worker Sal to “limit your exposure,” Don Draper is playing with fire. Don leaves Betty with the kids and drives to Miss Farrell’s apartment. “I want you to spend the whole night,” she whispers, and who can resist? In bed, she tells Don about a student who asked if everyone sees the color blue the same way. “People may see things differently,” Don says, “but they don’t really want to,” which is maybe the essence of modern American advertising and those who recognize that fact do well in this business. Don knows this…and so does Peggy. Despite the abuse she takes from Don on occasion she still seeks his approval. After Don rejects a commercial idea from Kinsey because it’s too long and too complicated, Peggy takes the concept and simplifies it. She found the essence of Kinsey’s pitch, focused it, and refined it. Don likes the new version and Kinsey seethes. He’s convinced that Peggy simply takes other people’s ideas and re-pitches them to the boss, who is more receptive to her because of her feminine wiles. Poor, dopey Paul Kinsey. During my hiatus we saw Burt Cooper finally pin Don with a contract by dint of a not-so-subtle threat in the question, “Would you agree I know something about you?” This came quite a while after Cooper told Don that the firm was ready to push him as the public face of Sterling-Cooper but that this mysterious past better not come back to bite them. Now we have Draper receiving his $5,000 signing bonus that comes along with a heads up from British CFO Lane that the big boys from across the pond would be in attendance for the Sterling-Cooper 40th Anniversary celebration. Don, as it happens, will be batting clean-up for speeches before the entire advertising world and their clients. This is the spotlight and Draper better be ready for prime time. Little do any of them know yet that it’s also a parade for potential buyers as Sterling-Cooper is once again on the auction block. As you might guess, Don spends a LOT of time with his new honey. There are few things more exciting than those first weeks of a new romance and Draper is on Ms. Ferrell like a jack rabbit. After one particularly rousing set there’s a knock at the door. It’s Ms. Ferrell’s brother, Timmy, who looks a little worse for wear but assure Don he’s not a junky. Turns out Timmy suffers from “fits” and has been booted from another menial job. You can’t help but have flashes of Draper’s own little brother who showed up unannounced in the Sterling-Cooper lobby a couple years ago. You also can’t help but wonder if Draper’s thinking the same thing. The guilt of his brother’s subsequent suicide when Draper pays him to get lost haunts him like those fading photos he keeps locked in a box in his office. You know, the drawer Betty’s been trying to jimmy for ages? She finally gets in when Don accidentally leaves the keys in his pants and they end up tumbling around the dryer for Mrs. Draper to find. Nonplussed by the neatly wrapped bills Draper’s been squirreling away, Betty goes right for the box and the accompanying documents that reveal her husband’s past. Remember, this was the guy who didn’t have a soul at their wedding. She now knows why and finds a divorce decree to boot. Betty readies herself for a kitchen showdown but Don of course never comes home. He’s working late again, if you know what I mean. Back at the office the next day, Roger Sterling and Burt Cooper reminisce about their careers and the agency that is their namesake. Neither is exactly looking forward to the company’s fortieth-anniversary party, but each for different reasons. Roger loathes the thought of watching Don achieve an award “for his humanity.” Cooper can barely stand the thought of the ghosts in the room. He started the firm with Roger’s old man and now he’s simply a figurehead in a shop that’s about to be handed off yet again. That’s gotta hurt your pride. In a limo on the way to the party, Roger’s mother confuses Jane with his daughter Margaret. “Jane is my wife,” says Roger. “Does Mona know?” his mother asks. Zing! Despite standing her up the night before, Don convinces Betty to doll it up and represent the Draper name with her famous glamour and grace. 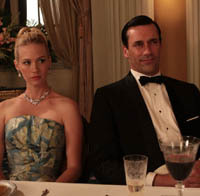 Betty, always the good wife—or perhaps out of sheer fascination for how it is Don can continually pull off his feats of charming miracles—abides and watches Don bask in the glow of the Sterling-Cooper celebratory spotlight. His exposure is increasing, at home and at work. At what point does he get burned? Paul and Peggy, set into competition with each other, both work late in their offices on a concept for Western Union: When is a telegram more appropriate than a phone call? Paul takes a few tugs on the bottle (and then a few tugs on something else) to get the ideas going and hits upon a bit of brilliance in a late night drunken conversation with the janitor. Convinced that he’s about to finally best Peggy, he retires to his office only to wake up the next morning without a recollection of his genius idea. Kinsey confesses his problem to Peggy and cites an ancient Chinese proverb, “The faintest ink is better than the best memory.” When Draper begins to dress Kinsey down for coming up empty, Peggy defends her comrade and asks him to recite the proverb. That’s when it dawns on Peggy that a telegram is better than a phone call because a telegram permanent; it’s something you put in a box and save. Dumbfounded, Kinsey stares at Peggy and Draper who once again take a kernel of an idea and turn it into gold. Once again, they saw it differently. I feel that this is one of Peggy’s major flaws. That she is still seeking approval from Don. It’s also one of Pete Campbell’s major flaws. I wonder if Peggy will come to regret her decision to remain with Sterling Cooper.